Sis. 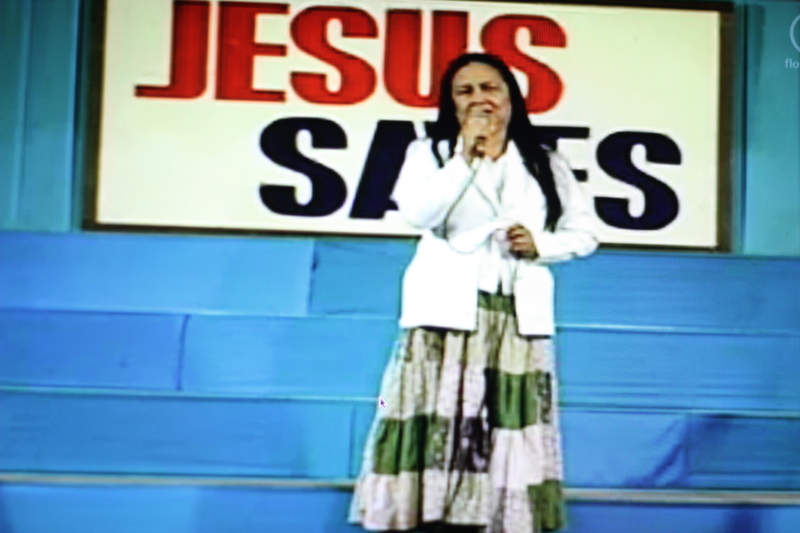 Victoria dela Cruz testifying in the pulpit; Friday overnight worship service, March 2013 at Amoranto Stadium. In 1997, Sis. Victoria started to feel pain in her lower belly. This continued for days until she told her grown children about it. They brought her to a hospital to be diagnosed. It was found out that she had the onset of a cervical cancer. But after more thorough diagnoses in two other hospitals, doctors found out that she had stage 2B cervical cancer and that surgery could no longer help. They said that 60% of her body had been affected by the cancer cells. They referred her to St. Luke’s Medical Center to undergo linear accelerator (radiation treatment). After a series of these treatments, Sis. Victoria began to weaken. She begged her children to stop the treatment. She believed she wasn’t getting well. Her children discussed with their mother’s doctors and complained why their mother wasn’t getting well despite the treatments. The doctors explained that the treatments will not cure her but will only try to destroy the cancer cells in that specific region and prevent them from spreading. The treatments did not help Sis. Victoria. Soon she was very weak and was bleeding incessantly. She stayed mostly in bed. Even sitting up had become difficult. Her children wanted her to be treated further in the hospital but she rejected it. So, they went to different quack doctors and faith healers. They went to St. Therese in Tagaytay where it was rumoured that the sick receive healing there. They got “holy water” from these so-called holy places and immersed their rosaries in the water before they prayed the rosary. But none of these helped Sis. Victoria. If anything, she became worse. But the workings of the true living God are unique and marvellous. He will do everything in His majestic power so that those He had chosen from the foundation of the world would come to know His great mercy. One day in the office of one of Sis. Victoria’s children, there was a special occasion. She got to talking to one of the catering staff. As Divine Providence would have it, her mother’s illness was discussed and it turned out that this person from the catering service was a born-again Christian and served the Lord in JESUS MIRACLE CRUSADE INTERNATIONAL MINISTRY. She told her about the many testimonies of God’s miraculous healings she had heard in Church, and invited her and her sick mother to attend the worship service and receive the Lord Jesus Christ. Sis. Victoria’s daughter was so excited to tell her about this. There was hope! She urged her mother to come with her to the worship service so she could receive divine healing. But her mother didn’t want to go. She wanted to cling to the old church she grew up in. Sis. Victoria’s daughter went ahead and attended the worship service. There, she poured out all her grief. She cried out to God. She wanted her mother to live and she knew only God, the true God, can help her now. The following worship service, she implored her mother again to go with her. This time, her mother was powerless to resist her (and she wondered why she was so yielding to her daughter’s urgings). The Lord had begun His mighty work on her. Sis. Victoria and her children attended the worship service of JMCIM at Cuneta Astrodome. While the choir was singing, one of her children noticed something happening to her mother that her mother wasn’t even aware of. So, she told her mother to sit up (for she was lying down, feeling weak due to her constant bleeding). She assisted her to sit up. While the choir and the whole congregation sang and worshiped, Sis. Victoria was sitting upright and didn’t feel any weariness. She and her children marvelled at this. She received the Lord Jesus Christ as her Lord and Savior. Before the baptism in water, she was doubtful. She didn’t want to go into the water thinking that she might stain the water due to her profuse bleeding. She told the sisters who were assisting her about this. But she was told she need not worry about that. When Sis. Victoria came out of the water, she felt her bleeding stop. Indeed, her bleeding stopped from that moment on. And she received complete healing. That was sixteen years ago and her cancer never came back. Together with her family, she continues to serve the Lord faithfully to this day. Hallelujah! To God be the glory! I’m so blessed to have found the Fountain of Life, Yasmin! The Lord Jesus is, and He is our Healer! You will see here that there is a wellspring of testimonies of God’s miracles. I hope you’ll come back for more. Blessings!